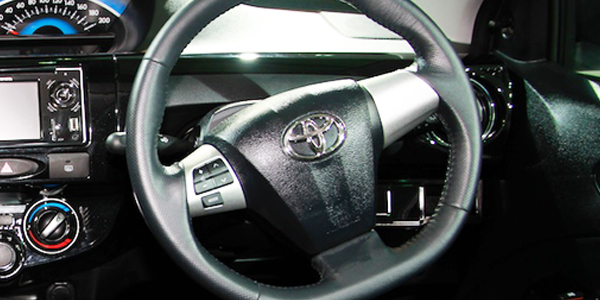 Toyota Etios Cross gets a three spoke steering wheel with silver accent that looks decent and comes with audio controls mounted on it. This feature is present only in the diesel varies of the car and the petrol variants do not offer this convenience feature. The all new Volkswagen Cross Polo offers direct competition to Toyota Etios Cross as it targets the same customer base and both the cars are priced similarly. Just like Toyota Etios Cross, Volkswagen Cross Polo also hosts audio controls mounted on its steering wheel but only on the top trim. Ford EcoSport and Renault Duster are two of the hottest selling cars in this segment and offers tiff competition to Toyota Etios Cross. Ford EcoSport offers audio controls mounted on the steering wheel in three out of its four variant. The refreshed version of Renault Duster comes equipped with cruise controls buttons mounted on the steering wheel but it offers no audio controls. The variants of Toyota Etios Cross that offer steering mounted controls as standard include V, VD. The variants of Toyota Etios Cross that do not offer steering mounted controls as standard include 1.2 X Edition, 1.4 X Edition, G, GD.